It's easy to use and programmable. The automatic warm setting is especially handy for hot chocolate. Highly rated by Cooks Illustrated. This is another tool that gets lots of use in my kitchen. It's essential for this recipe to smoothly blend the ingredients. I use 2 of these for storing a batch of this hot chocolate in the fridge. They're also handy for iced tea, coffee, and spiced cider. This makes it easy to neatly pour from wide-mouth mason jars. High quality and the best choice for rich, chocolaty flavor. These have yummy chocolaty flavor. I use them in chocolate chip cookies, too. This is intensely rich with luxuriously deep flavor and smooth texture. This has two ingredients (concentrated organic milk & sugar) with no additives or thickeners. A big batch recipe 3 ways -- creamy American-style, more chocolaty, or dark, rich European-style. Stovetop instructions, too. This easy, delicious big batch recipe is a real crowd pleaser. Adjust the amount of chocolate to suit your preference from light and creamy to rich, dark European-style hot chocolate. Great for parties and holidays. 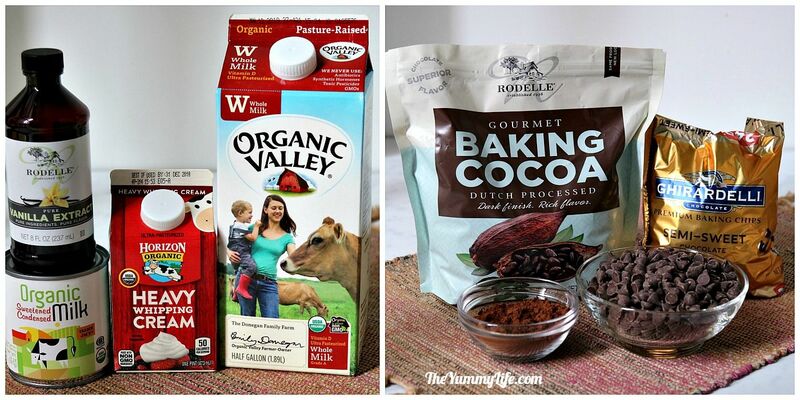 TO MAKE IN SLOW COOKER: Add all base ingredients to slow cooker, sprinkling the cocoa powder on top. Whisk to combine until dry cocoa powder is incorporated and no longer floating on top. Stir in chocolate chips or chopped chocolate (plus espresso/coffee powder, if using). Cover and cook on low for 2 hours. Whisk until any melted chocolate bits in bottom are mixed in. 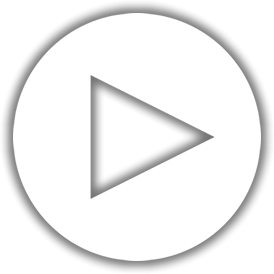 Switch to warm setting to hold for extended period. 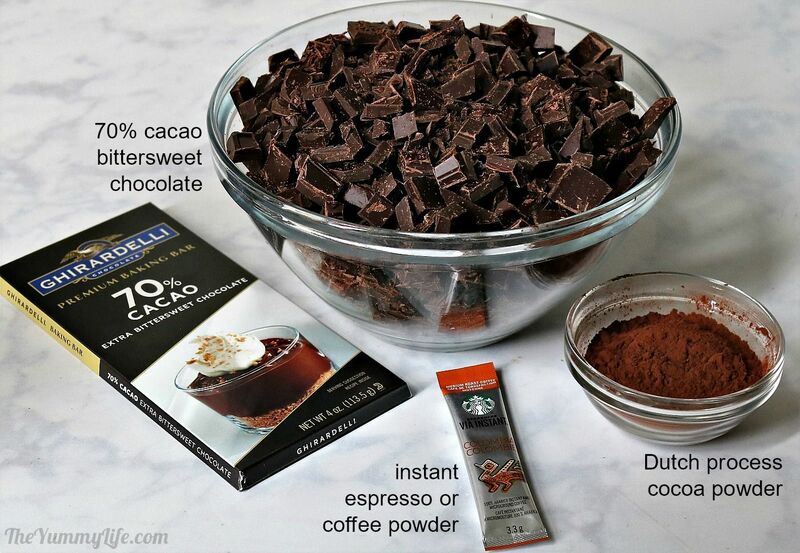 TO MAKE ON STOVE-TOP: Add base ingredients to 4-qt (or larger) pan, sprinkling cocoa powder on top. Whisk to combine until dry cocoa powder is incorporated and no longer floating on top. Heat on medium-low heat until steaming, whisking frequently to prevent scorching. Stir in chocolate chips or chopped chocolate; whisk until chocolate is completely melted in and evenly combined. Keep warm on lowest stove-top setting or tranfer to insulated carafe. 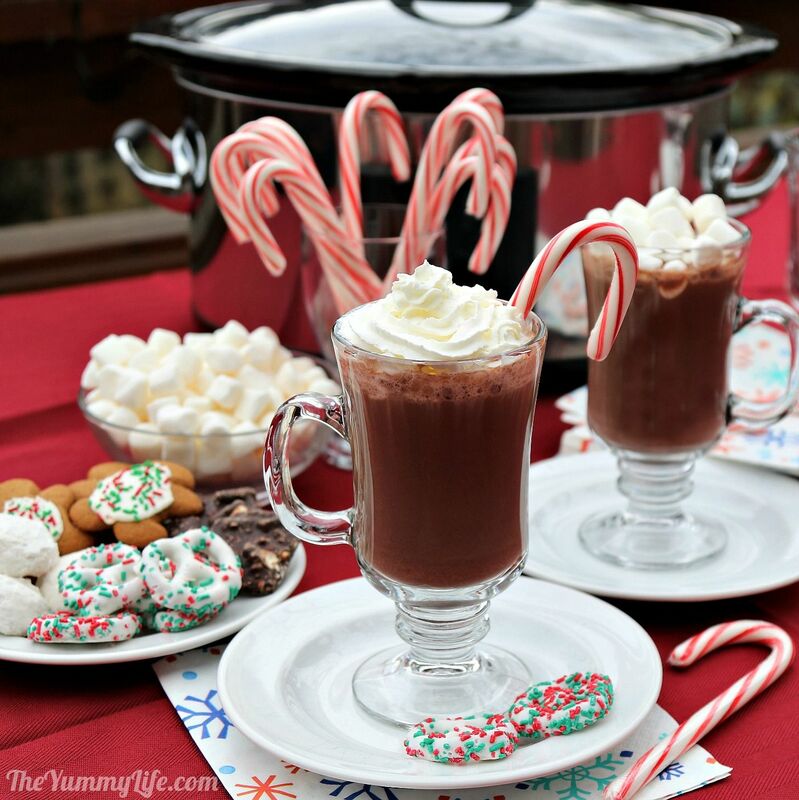 TO SERVE: Ladle hot chocolate into mugs, top with marshmallows or whipped cream. Sprinkle tops with cinnamon, if desired. Candy canes or cinnamon sticks may be added to mugs for stir sticks. TO MAKE-AHEAD: Hot chocolate can be cooled, covered and refrigerated for 2-3 days ahead. TO REHEAT: Large amounts may be reheated on low in the slow cooker or on stove top. Single serving mugs of hot chocolate may be heated in microwave, being careful not to boil to avoid scorching. Full batch makes fourteen 8-oz. cups of hot chocolate. What can be better than a mug of hot chocolate on a cold day? 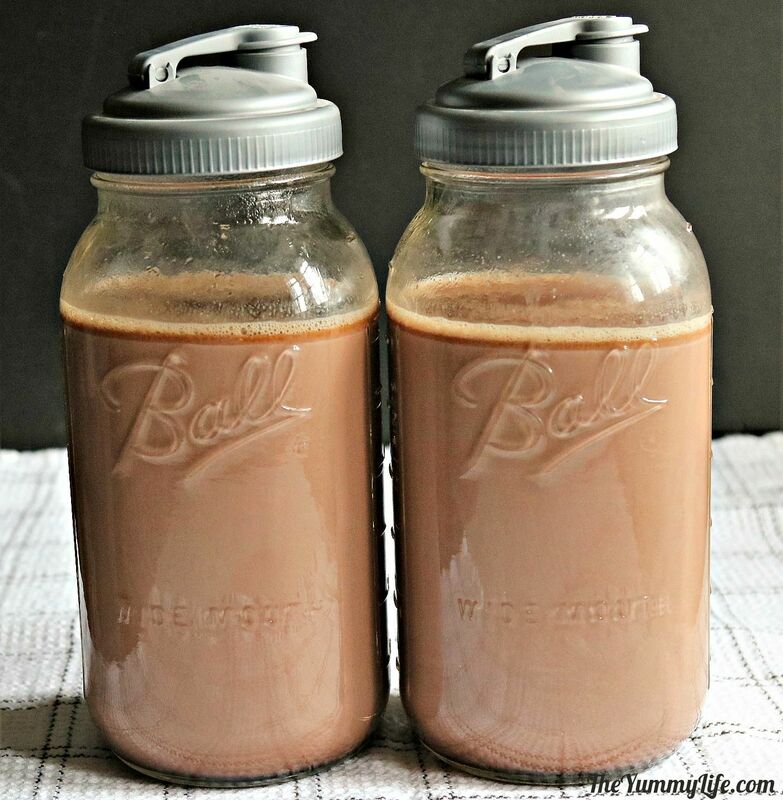 Although it's great to have the instant hot cocoa powder on hand for a last-minute mug (check out my Double Chocolate Hot Cocoa recipe), it really can't compare to hot chocolate made from scratch with milk, cream, and melted chocolate. This recipe is the real deal, and so easy to make. How much chocolate should there be? 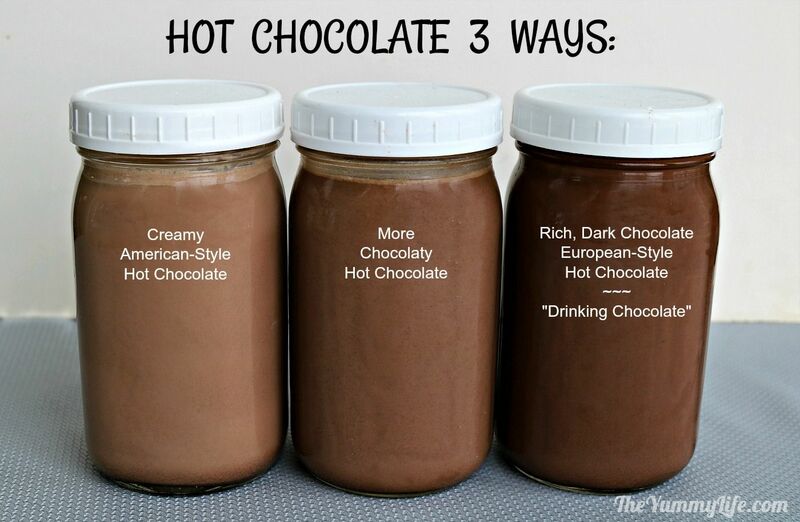 There's not always concensus about just how chocolaty hot chocolate should be. Is it better on the creamier side (the traditional American style) or on the darker, richer side (the European style--also known as "drinking chocolate")? I wasn't sure which way to go with my recipe, so I solicited some help from the crew at my sons' company, LACRM. When I asked them to taste-test a couple of batches of hot chocolate, they were enthusiastically willing to help out. They're nice that way. After a little experimenting with ingredients, I made two batches in slow cookers--one creamier, one darker & richer. Let the tasting begin! Thanks to Maggie, Jesse, and Tyler (pictured above) and all 16 taste-testers. The results of the test were........inconclusive! Some of the tasters liked the creamier version, some preferred the darker, richer version, and some chose to mix the two to make a "medium" chocolaty mug. 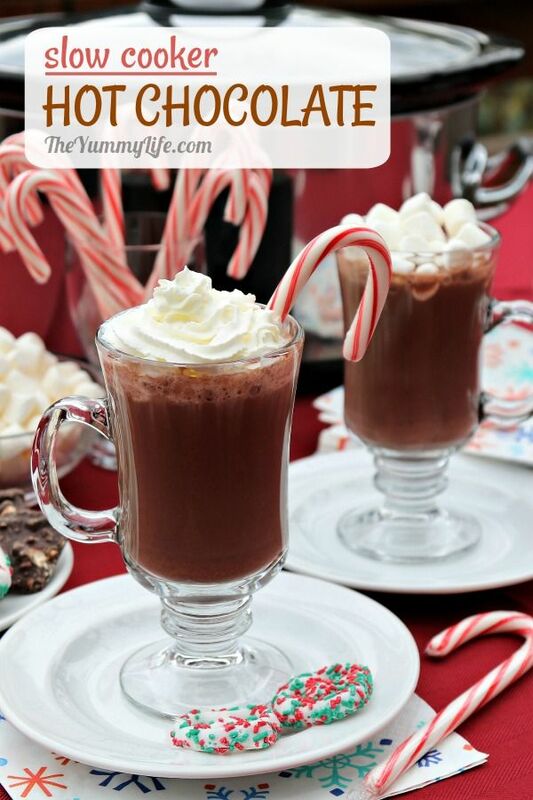 So, rather than settle on one recipe, I decided to share a basic recipe with modifications for making a batch of hot chocolate however you like it. Slow Cooker or Stove-Top. My 3 recipe variations can be made either way. Choose the slow cooker method if you want to set it and forget it for a couple of hours (It can hold on the warm setting for an extended period.) Choose the stove-top method if you're in a hurry--it only takes 15ish minutes. 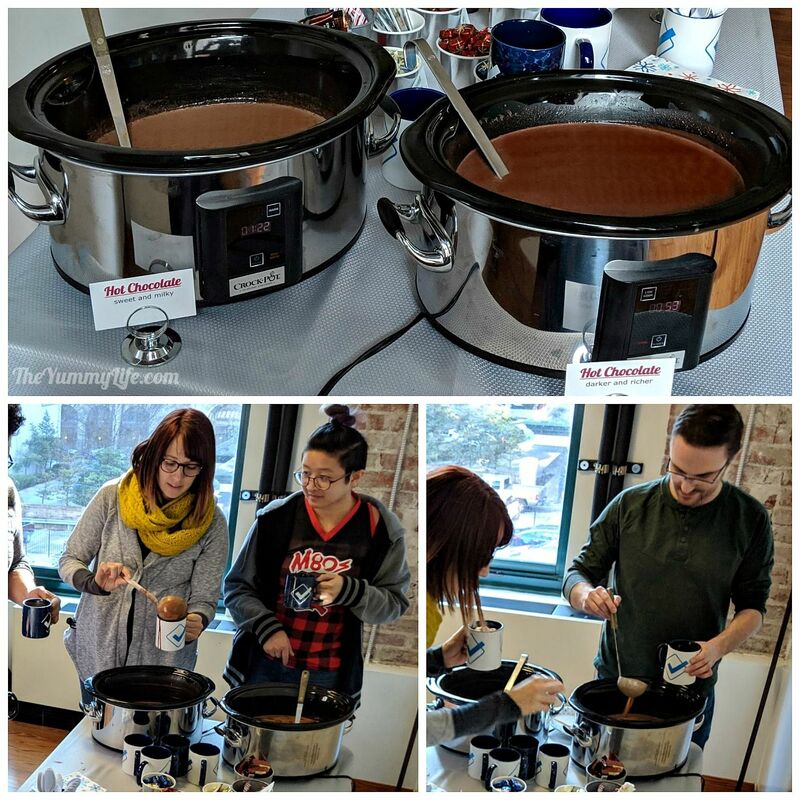 The photos below illustrate making hot chocolate in a slow cooker. Stove-top instructions follow them. To make a batch of the more chocolaty or darker European-style hot chocolate, chop up some good quality bittersweet dark chocolate that is at least 70% cacao. Optional: add a little instant espresso or coffee powder to intensify the chocolate flavor even more (it won't make it taste at all like coffee--promise). This is a trick I learned from Ina Garten, and Ina knows! Step 2. Add the milk, cream, sweetened condensed milk, and vanilla to the slow cooker, sprinkling the cocoa powder on top. Whisk to combine until dry cocoa powder is no longer floating on top. Step 3. Add chocolate chips or chopped chocolate. Cover and cook on low for 2 hours. Whisk it thoroughly to make sure melted chocolate on the bottom gets mixed in well. TO MAKE ON STOVE-TOP: Add base ingredients to 4-qt. (or larger) pan, sprinkling cocoa powder on top. Whisk to combine until dry cocoa powder is no longer floating on top. Heat on medium-low heat until steaming, whisking frequently to prevent scorching. 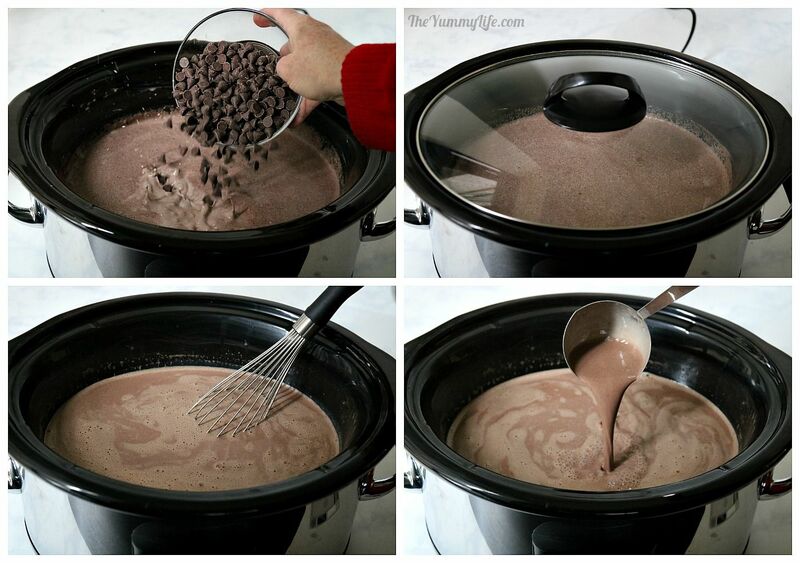 Stir in chocolate chips or chopped chocolate; whisk until chocolate is completely melted in and evenly combined. SPIKE IF YOU LIKE! 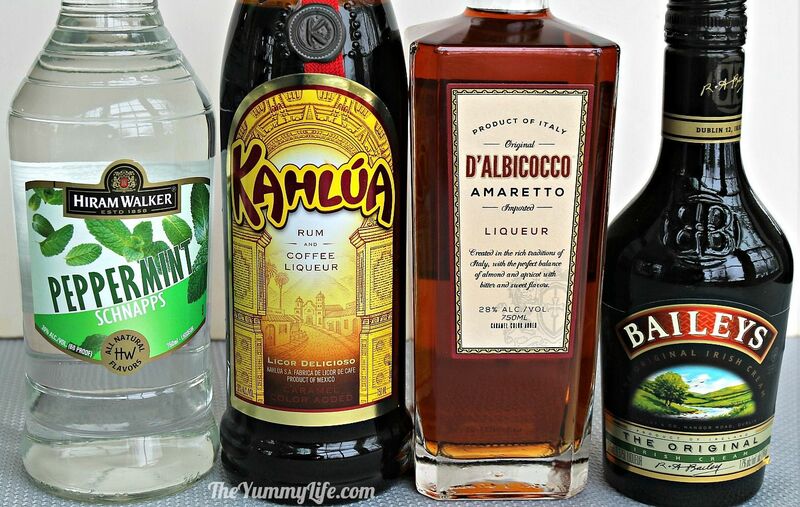 A shot of any of these liqueurs turns a mug of hot chocolate into a hot cocktail drink for adults. 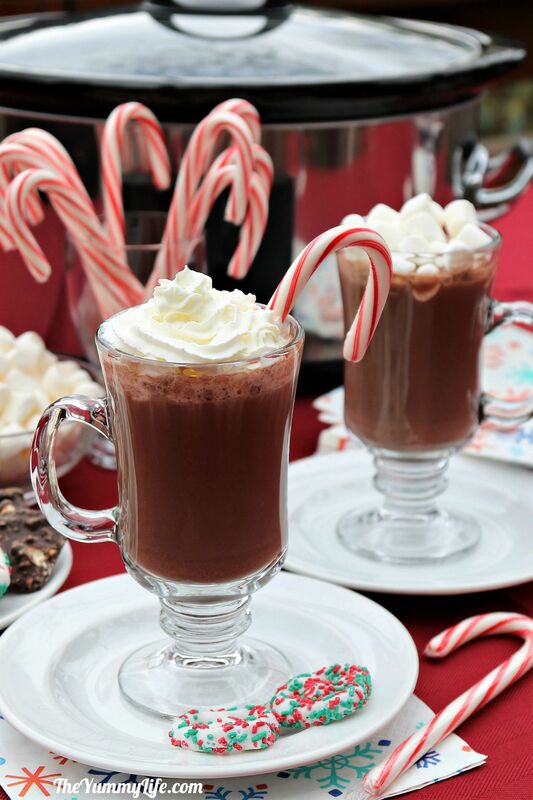 TO MAKE AHEAD: Hot chocolate can be cooled, covered and refrigerated 3-4 days ahead. I store mine in 2 half gallon mason jars with pour lids. That way I can easily pour and heat a single mug. Give the jars a good shake or stir to remix ingredients before pouring. TO REHEAT: Large amounts may be reheated on low in the slow cooker or on the stove top, whisking to recombine ingredients. Single serving mugs of hot chocolate may be heated in the microwave, being careful not to boil to avoid scorching the milk/cream. 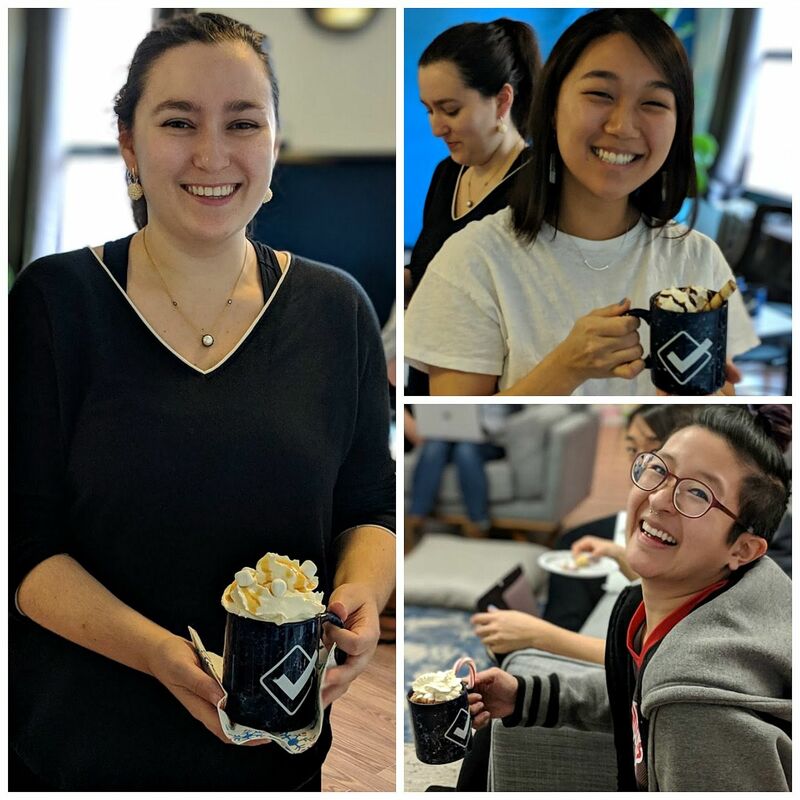 Everyone enjoys a mug of chocolaty happiness! Thanks to these happy taste-testers: Julia, Kelly, and Jesse.